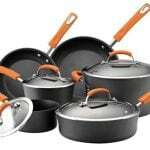 The Circulon Symmetry Hard Anodized Nonstick 11-Piece Cookware Set is almost identical with the Circulon Infinite Hard Anodized Nonstick 10-Piece Cookware Set. The differences between these 2 sets, made by the same producer, are the handles and the number of pieces included in the package. The Circulon Symmetry Set features handles made of plastic compared with Circulon Infinite, which includes handles made of stainless steel. The handles from this set are shorter than the ones from the other set. However, the quality of both sets is high-standard. According to numerous consumers, it is a matter of personal choice whether to go for Circulon Symmetry or not. 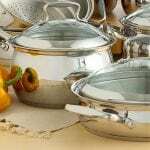 The handles made of plastic are firm, sturdy and they are able to hold the weight of a full pot or pan. 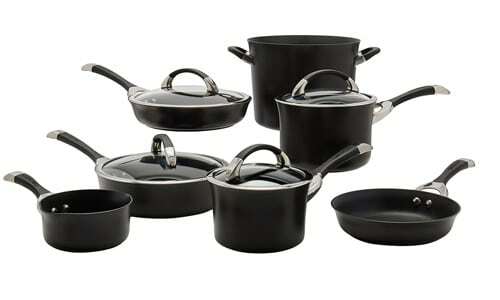 So, if you especially like the look of black plastic mixed with silver stainless steel, this set is for you. Except the elegant design and the attention to details regarding its aspect, Circulon Symmetry is highly effective and durable. A pleasing cooking experience always starts with efficient cookware and a little imagination. Even when the cook makes some mistakes, the manufacturing ingenuity of this set will save the situation. The completely non-stick surfaces keep you away from vulnerabilities such as burning the food or wasting too much time. Circulon has made a name for itself during its 25 years of activity. This company does not only produce and invent cookware, but its management is also preoccupied by bringing ways to cooking healthy in the homes of their customers. The entire idea of a non-stick pan is originated from Circulon’s desire to provide cookware in which anyone can simply cook something healthy. 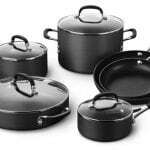 Moreover, the healthy lifestyle is also encouraged by the manufacture of very durable cookware and other kitchen utensils. Circulon excels on this market and it aims to continuously improve its products, even if they seem quite perfect already. 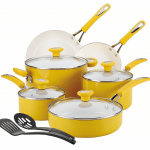 Plastic handles for light-weight – This cookware set is equipped with handles made of plastic and stainless steel, not entirely from stainless steel. This characteristic makes the pots and pans more light-weighted. Firm grasp of handles – The handles stay cool even after long exposure to heat. The grip is firm and very safe. 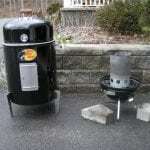 Thin walls, thick bottom – The bottom is made of 3 different layers of metal meant to distribute the heat evenly. 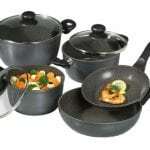 Intelligently sized pieces – From small to large, this set includes various sized saucepans and skillets. The end of the handles holds water – When washed by hand or in the dishwasher, the end of the handles retains water. The ends are not completely enclosed. Useless Circular Grooves – The circular grooves from the inside bottom of every piece might be uncomfortable for cooking sauce, but they are useful for protecting the non-stick feature. 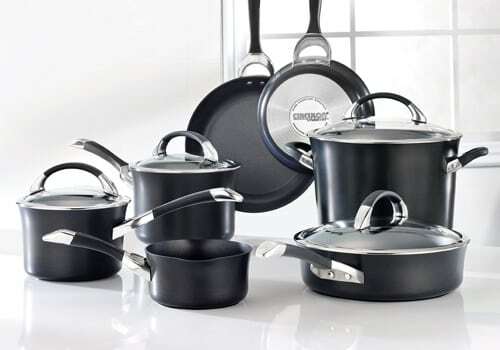 The Circulon Symmetry Hard Anodized Nonstick 11-Piece Cookware Set is all about making cooking a pleasure and diversifying the offer in terms of colors and materials. This set is comprehensive and of very high quality. In this 11-piece set, Circulon has mixed a sophisticated image with an unthinkable level of effectiveness.